How to test read & write speed of USB flash drive? Do you want to test speed of your USB flash drive? USBDeview is a cool utility that allows you to measure read and write speed of any USB flash drive connected to the computer. To get started, download USBDeview utility, unzip it and double click its icon to start the utility. This utility does not require installation, you can start it using direct exe file. Now plug your USB drive to the computer and you will notice it in the list of detected USB devices with status YES for connected. Now goto File > Speed Test or use Ctrl + T keys to start the speed test. It will show the read and write speed of connected USB drive. 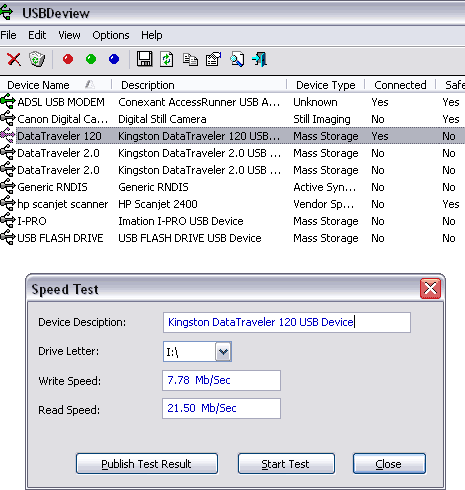 Besides measuring the USB drive speed you can also publish and compare speed data online. Hit the publish test results button to display results on nirsoft website and allow users to compare speed of different USB flash drives. Download USBDeview and measure speed of your USB flash drive on the fly!